Portsmouth, New Hampshire is home to today’s “Museum of the Day,” an amazing living history museum that features 10-acres of outdoor history. 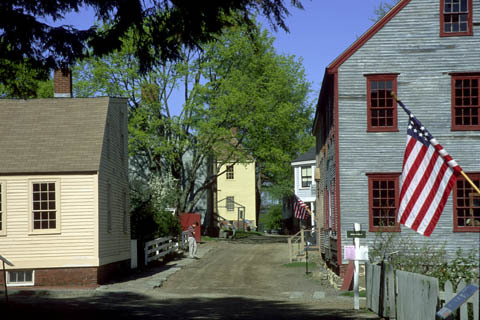 Strawbery Banke Museum is listed on the National Register of Historic Places and is dedicated to bringing 300* years of American history to life. Strawbery Banke is a place to learn about architecture, heritage plants and foodways, traditional crafts and the tools, clothing and collections people used for everyday life in the 1600s, 1700s, 1800s and up through 1954 when the site was saved from urban renewal. The museum is a place for children, adults, multigenerational families and groups to gather to explore heritage gardens, historic buildings and crafts, preservation programs, hands-on activities, the stories told by costumed role-players, hands-on traditional crafts and the changing exhibits that offer hours of fun and discovery. The museum’s restored buildings and open space invite visitors to immerse themselves in the past. Strawbery Banke is a sustainable place that preserves and enlivens three centuries of war and peace in the same New England waterfront neighborhood. Each year the museum welcomes 75,000 visitors, members, schoolchildren and volunteers who love New Hampshire history for daily programs, exhibits and signature special events from May through December. I look forward to a visit when I travel to New England this summer!